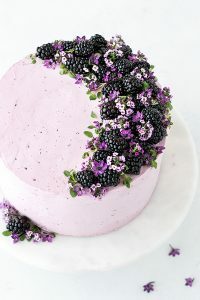 Blackberry Lime Cake – tender cake infused with lime zest, frosted with blackberry buttercream, topped with fresh blackberries and edible flowers. Preheat oven to 350F. Butter and lightly flour three 8″ round pans. Line with parchment paper circles. Whisk together flour, baking powder, baking soda and salt. Zest limes and whisk into flour. Set aside. In a small bowl, combine milk and lime juice. Stir to combine and set aside for milk to curdle. This is similar to making homemade buttermilk. In the bowl of a stand mixer, beat butter and sugar on medium-high using the paddle attachment. Beat until pale and fluffy, about 3 minutes. Add the flour mixture in three batches, alternating with the milk, beginning and ending with the flour mixture. Do not over mix. Stop the mixer and scrape down the bowl and the mixer blade. Bake for 25-27 minutes, or until toothpick inserted into center comes out clean. Let cool in pans for 5 to 10 minutes, then remove to wire rack to finish cooling. Combine blackberries, sugar and lime juice in a pan over medium heat. Cook 10 to 15 minutes until the juices are bubbly and the berries are soft enough to smash with the back of a spoon. Press the mixture through a fine mesh strainer into a clean bowl to remove the seeds. Use the back of your wooden spoon to really press as much pulp through as you can. Scrape the underside of the strainer to get all of the accumulated blackberry pulp. Discard seeds and return strained puree back to the pan. Cook on medium, stirring with a wooden spoon, until reduced to only a few tablespoons, about 10 minutes. Pour into a small bowl and cover with plastic wrap, pushing the plastic down to touch the blackberry reduction so that a skin does not form. Allow to cool. Place egg whites and sugar into the bowl of a stand mixer, whisk until combined. Add vanilla extract and whip on medium-high until silky and smooth, about 3 to 5 minutes. Add blackberry reduction and whip again until incorporated. The buttercream may look like it’s broken at some point. Keep mixing until it is completely smooth. Place one layer of cake onto serving plate or cake stand and top with about one cup of blackberry frosting. Repeat with second cake layer, more frosting and then last layer of cake. Crumb coat and frost cake with remaining frosting. Decorate with additional blackberries and edible flowers. Start by laying out blackberries in a crescent shape, spacing them close together but not touching. Tuck in small sprigs of the micro mint here and there, but not everywhere. Next, add the alyssum, using only the top blooming section of each sprig. Add a few extra berries for height if needed. Fill remaining small holes with the micro pepper blooms. Reserve extra berries and blooms to adorn individual slices when serving, if desired. Be careful not to pack flour into the measuring cups. Too much flour can result is a heavy and overly dense cake. 3 cups of cake flour is 336g when properly measured. If you do not have a scale, spooning flour into the measuring cup and then leveling off the excess is the next best way to measure. When finished mixing the cake batter, be sure to scrape down the mixer blade to grab all the lime zest that has accumulated. Fold back into the cake batter before diving into pans. You may bake this as two full-sized 8″ round cake layers. Alternatively, I baked it as three intentionally shorter 8″ round layers – this saves time and effort because the shorter layers do not need to be torted. The resulting layers are approximately 1.25 inches tall. If only using two pans, be sure to only fill them 2/3 of the way full to prevent overflowing. If at any point the buttercream appears curdled, just keep mixing. If the buttercream appears soupy, try placing it in the refrigerator for about 10 to 15 minutes then mixing again. To amp up the fresh blackberry flavor, make a double batch of blackberry reduction and spread a thin coating between the cake layers. Or slice fresh berries in half and add them between the cake layers. Add flowers just before serving as they will wilt over time, especially when refrigerated.